An eight-month-old puppy was banned from going anywhere near David Cameron “for security” reasons on Sunday after the prime minister gave a speech in Cheltenham. Cameron was visiting Cheltenham to lay out the Conservative Party’s plans for inheritance tax in Britain. When Cameron walked out of the church hall where he gave his speech, he found himself bombarded by a crowd of TV crews and voters waiting to speak to him. Passer-by Sarah Styler, 49, approached the scene with her dog, hoping to speak to the PM, but was shocked to discover she could only talk to him if her dog was removed from the vicinity. Once at ease, Cameron briefly spoke to the crowd of voters, and commented on the sunny weather before heading off in his car. 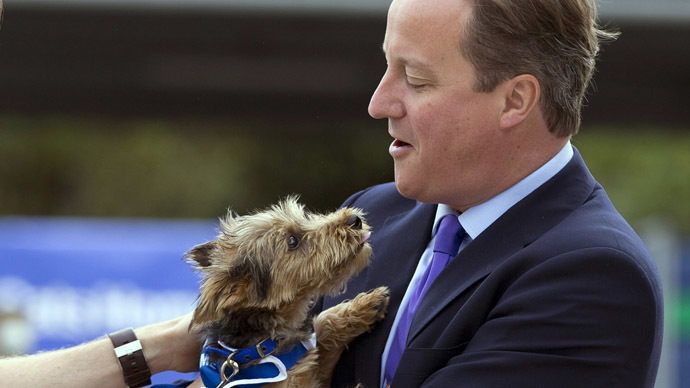 “The prime minister loves dogs, but it was just for security,” a Tory aide told Styler when he returned the dog to her. @johnestevens@ostercywriter "The Tales of Cameron On The Road" are more Bizarre everyday. @johnestevens@carmella101 It's for the dog's own safety, in case he gets rabies, the dog that is. I'm sure Cameron has distemper also. Another user said the ban was “for the dog’s own safety in case he gets rabies” from the PM Prime. “Perhaps it was a terrier-ist?” one user joked. It appears Cameron either has a phobia of dogs, or simply has bad luck with them. In 2013 when he visited the Battersea Dogs home, a canine wriggled out of his arms after a second of him holding it. Cameron is a cat owner. The Downing Street cat Larry moved into No. 10 shortly after the PM did.